River Hebert may be a small community in rural Nova Scotia, but BOY! do they know how to play!! Imagination was big and duct tape was plentiful. 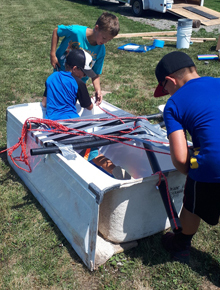 So many fun ideas, and lots of working together changed a super hot summer day into an exciting play day for kids of all ages. Click on the photo to the left to see a power point of photos.